Little Jigheads with a big bite. 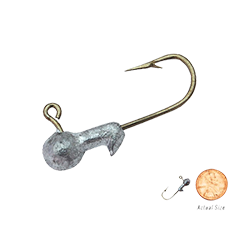 These tiny heads, featuring an optimal "down" bait keeper ideal for holding tiny bodies and fitted with a super sharp Eagle Claw® #8 hook, are a perfect complement to Itty Bitt Swim'Rs. Unpainted. 20-count pack.